The Ka-Bar BK2 campanion by Becker is an awesome knife. It is a knife that is right at home in the pocket of a bushman, a hunter or somebody just out on a weekend camping trip in the woods. 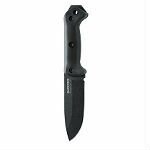 This knife features a 1095 cro-van durable steel blade and has any number of uses. It can be used for chopping up small sticks and kindling for firewood. It is well balanced and plenty grippy with its Grivory handle. Not the smallest of knives there is – coming in at 10.5 inches in overall length with a blade length of 5 and a half inches. It is made in the US and the quality is exceptional. Overall it is a very strong rugged bushcraft knife. It comes with a glass filled nylon sheath to keep it safe when not in use and you can easily attach it to your belt when on the move. When it comes to a trustworthy multi use knife you cannot go wrong with the Ka-Bar BK2. 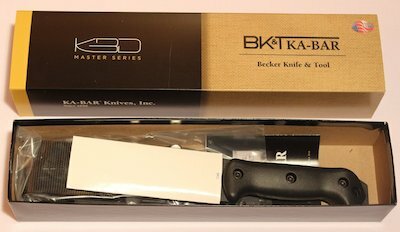 We are giving it 5 stars because in our minds its one of the best camping and bush knives on the market and it comes with the quality you would expect from the Becker Brand. It is a bit heavier than some other knives but thats one of the features we like about it. It is strong and can take a good beating. Well balanced in your hand and does exactly what it is supposed to. You might have to take it easy at the start with this knife till you get used to it but when you do you will be glad on your decision to go for the BK2. Manufactured – Made in the USA.